Well, well, well…just when I thought McCain’s chances of overtaking Obama in this election were slim and none (ok, and Slim just left town), we get news that he actually out raised Obama by twenty million dollars in May!. That is astounding when you consider the money machine Obama has in place. Senator Obama broke all fund raising records by raising an incredible two-hundred eighty-seven million dollars in his campaign for the Presidency. Obama has declined public funding of his campaign. Obama initially stated he would accept public matching funds. I think it is admirable of him to decline public funds. I really do. But, it might come back to haunt him if he starts falling behind McCain in the polls. If he does, that money making machine just might dry up if it appears he will get beat. . However, I think it is unlikely Obama will suffer for money. Americans are ready for change.. Obama claims to be the agent of change. But, at what cost will this “change” be? Obama is going to make mistakes. He’s going to raise taxes on an already overburdened U.S. taxpayer. Saying he would negotiate with America’s enemies was a blunder. I also thought he was a bit disingenuous when he stated last week the GOP was going to use race as an issue in the campaign. His statement about race really was surprising since he has said from day one race should not be an issue. Yet, he brings the issue to the forefront by mentioning it. Look for the Democrats to use this against the GOP at every opportunity. I do not believe the GOP will bite. They saw what a serious mistake the Clintons made by subtly bringing up the race issue during the primary season. This campaign should not be based on any single issue, especially race. It should be based on ideas. It should be ideas that will bring this nation back on the straight and narrow. We seem to have lost our way during the Bush Administration. We got into a war that was not necessary in my opinion. Like his father, W has let the economy slide into oblivion. I’m not blaming him for the rising gas prices. Speculators, a weak U.S.dollar all have contributed to rising gas prices. But, as Harry Truman said, “The buck stops here.” W has to take responsibility because it all happened on his watch. Back to the point of this blog entry…both Obama and McCain have weaknesses that each respective party will try to exploit. Obama is relatively young and inexperienced. He will be portrayed as weak and indecisive on defense in a time of war. Obama has serious issues with Clinton supporters. He desperately needs them. McCain will be deemed too old and having medical problems. His position on the Iraq War is a big negative also. Plus, he has never been embraced by the GOP’s conservative wing. I think the failure of McCain to completely win over the conservatives will prove his undoing in the election. McCain will win over some or even a lot of Clinton supporters and his traditional strength among independents (of which I personally align myself) will help him also. But, I just don’t see it as being enough. This election is Obama’s to lose as long as he doesn’t make any serious mistakes. That won’t happen as long as there aren’t too many debates. His handlers need to limit his face time with the cameras also. But, I do believe it will be a very close election. 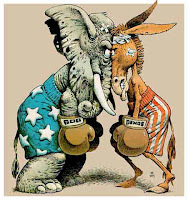 It will be much closer than political pundits believe. hmm I'm trying hard to avoid being strongly attached to American politics. However I do not want the republican party to win. Frankly, regardless of who wins, the USA will be the ultimate loser for a variety of reasons. McCain is Bush III and will likely involve us in a war with Iran. Obama is naive and thinks the world is a Shangri-La where everyone gets along. All they need is love. These may be two of the worst presidential candidates in US history. Obama, like so many blacks (or African-American is the new terminology) of mixed race, consider themselves black. Obama has repeatedly referred to himself as African-American. It shouldn't matter what he is. But, it seems ironic a man who has said he thinks race shouldn't be an issue, suddenly brings it up as an issue just last week. I don't care who wins, honestly. I dislike both. Most likely, I will either vote for the Constitution Party candidate or just sit out this election. I enjoyed your analysis. I think you were right on in your examination of each candidate's weaknesses. About the "black" issue, note that society chooses to see anyone of noticable mixed race this way, and just by virtue of looking black, you are subject to the overt and subtle discrimination that accompanies that perception. Having said that, I agree that Obama should not have brought it up. I found that puzzling. One theory is that he was putting it out there to get in front of the issue so that if it does come up, he can say "you see, I warned you they would try this" as opposed to complaining and being accused of "whining." While I know that McCain's camp won't go there, the same can't be said for the 527s. I guess we'll see how this plays out down the line. PS: I can't seem to get the Typepad ID working, but this is Tim from Mouthful of Politics. Great blog! Tim! Great to have you here. Now that I think about it, Obama mentioning the race issue might have been an attempt to cut the GOP off at the pass (so to speak). The GOP will not treat him nearly as nicely as the Clintons (who raked him over the coals). Obama's mention of the race issue was probably a calculated move to disarm the GOP completely. I don't think it will work. McCain is fighting an uphill battle as it is. If he goes soft on Obama, he might as well cash in his chips; the game is over. I do believe we are going to see extremists from both camps revealing some skeletons that both Obama and McCain would rather remain hidden (I know this for a fact about McCain...he is nervous about this). It's going to be a very interesting election. Thanks for stopping by. Enjoy your blog.